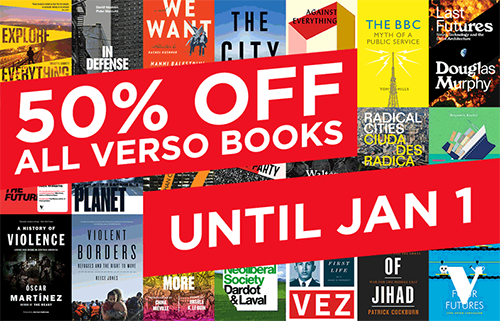 Starting on November 25th, we have 50% off ALL our books until Jan 1! We have free shipping worldwide and bundled ebooks* — meaning you can gift the print book (if you want to!) and start reading the ebook straight away! See our End-of-Year Highlights for book suggestions, and our 2016 Gift Guide. *PLEASE NOTE: free bundled ebooks are only where an ebook edition is available from Verso. Some books are not available in ebook format. Royal Mail Second Class: This delivery is free but it is unlikely that your books will arrive by Christmas - we recommend you consider UK Next Day service. UK Next Day delivery: we recommend you order by 21st December to ensure delivery for Xmas. UPS Second Day Air: We cannot guarantee your order will arrive by Xmas - we recommend you use one of our faster services. USPS Priority Mail: We cannot guarantee your order will arrive by Xmas - we recommend you use one of our faster services. UPS Next Day Delivery by 10.30: we recommend you order your books by 21st December to ensure delivery for Xmas. UPS Next day: we recommend you order your books by 21st December to ensure delivery for Xmas. USPS Media Mail: We cannot guarantee that your books will arrive by Xmas - please consider using one of our faster services. UPS Ground: We cannot guarantee that your books will arrive by Xmas - please consider using one of our faster services. Standard delivery: we cannot guarantee your order will arrive by Xmas - we recommend you use one of our faster services. For 3 Day Air we recommend that you order by 20th December to ensure delivery for Xmas. All other countries: Please note that we cannot guarantee delivery by a particular date.